Trying to describe Jancsó’s ode to the Russian Revolution is difficult. There is no traditional plot and there are no traditional characters – it drops the audience into the front line of the war between the Reds and the Whites in the violent years just after the Russian Revolution. Jancsó matter-of-factly shows us both sides of the conflict with complete dispassion. It’s not documentary-like either, as in Bloody Sunday – it’s a cinematic experience unto itself and a dazzling anti-war film. The film starts on the front line of the Russian Civil War of 1919 (aka Red and White War). The Reds are the Bolshevik Army, which has just overthrown the Czarist monarchy. They were comprised not just of Russians, but also workers from Romania, Hungary, Poland and other European countries. The Whites were a coalition made up of Czarist loyalists who wanted to overthrow the new Communist government. They were backed by, and in many cases fought by, other European soldiers and armies. The film opens in the Russian countryside with a wonderful dolly and crane shot as a platoon of Whites pursue a group of Hungarian Reds across a hillside. Some are captured and some escape. The escapees wander into a hospital barracks where they receive care. Soon after, the Whites catch up to them and pillage the premises looking for more Red soldiers. The film fluidly moves back and forth across both sides of the war. In the hospital the point of view inconspicuously moves to the White side of the battle. At times the soldiers don’t know who is on whose side and neither do we. After all, it was a civil war fought by multinationals on both sides. Jancsó doesn’t care about confusing the audience though - the brutality of war is his main concern. The film was meant to be propaganda, but often great films come from these political restraints. The films of Mikael Kalatozov (I am Cuba), Sergei Eisenstein (October) and Leni Reifenstahal (Triumph of the Will) come to mind. In fact, The Red and the White was born from a commission by the Soviet government to make a film commemorating the 50th anniversary of the Russian Revolution. There is more than just a thematic kinship with Kalatozov’s fantastic I am Cuba. Both films use breathtaking long takes and wide-angle black and white cinematography. The scene when the Red captain makes the White captives take off their shirts and run throughout the barracks like released animals at a fox hunt is brutal and humiliating, but it's expertly shot and choreographed. The use of wide-angle landscape shots in the final battle is a tremendous piece of cinema and reminiscent of the epic battle in Spartacus. Ironically, The Red and the White is an anti-war film masquerading as propaganda. 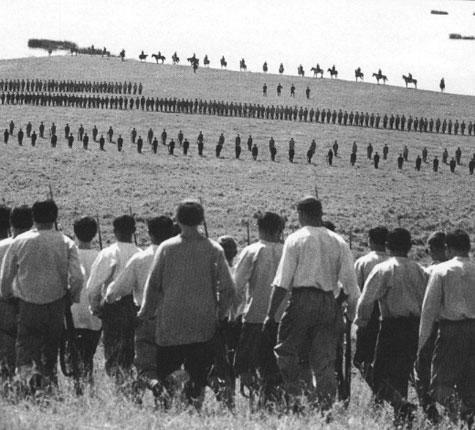 Despite being a commission of the Soviet government, the Soviets were not pleased with Jancsó’s cut and had the film re-edited to make the Reds more heroic. The film was eventually banned in the Soviet Union, but not before it was released in the U.S. and Hungary and became one of Jancsó’s most beloved films. Kino has a barebones DVD available. The transfer is from the print, which means the cigarette burns and handling scratches are visible, but it’s still beautiful to watch and a must-see for all cinephiles. I can't wait to discover Jancsó's other films. Any suggestions? Enjoy.